To ensure complete combustion of the fuel in the boiler furnace, enough air must be thoroughly mixed with the fuel. Pressurized furance and balanced draft are the two primary air systems for power boilers. 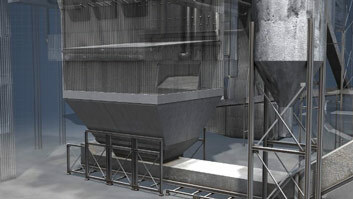 Air passing through fuel bed. 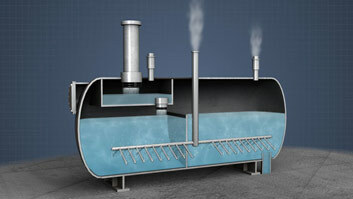 The purpose of a power boiler is to create steam by applying heat energy to water. The necessary heat energy is produced by combustion. Fuel and oxygen are required for combustion to occur. To ensure complete combustion of the fuel in the boiler furnace, enough air must be thoroughly mixed with the fuel. Each power boiler fuel requires a different amount of air for complete combustion and the combustion controls must be designed to provide it. 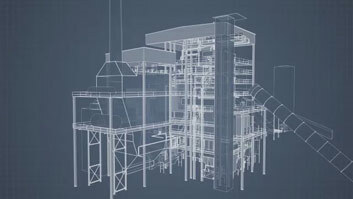 This module describes the role of combustion in power boilers as well as major components and flows of power boiler air systems. Combustion is the rapid chemical combination of oxygen with the combustible elements of a fuel, resulting in production of heat. 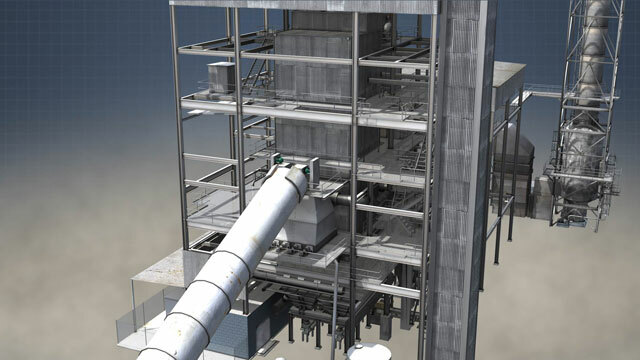 What is the role of combustion in power boilers? Combustion creates steam by applying heat energy to water. What are the two basic air systems for power boilers? Pressurized furance and balanced draft. 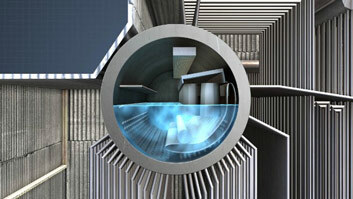 What are the major components of a power boiler air system? Forced draft fan, air heater, windbox, primary air fan, overfire air fan, and induced air fan. 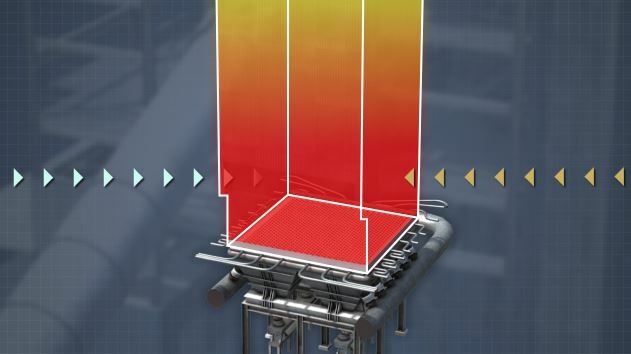 The purpose of a power boiler is to create steam by applying heat energy to water. The necessary heat energy is produced by combustion. Fuel and oxygen are required for combustion to occur. 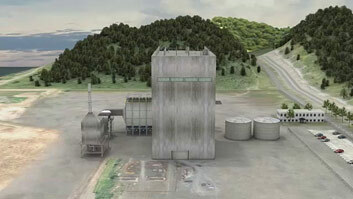 Air, which is 21% oxygen, provides the oxygen, while the major fuels used in the power boiler are natural gas, fuel oil, coal, and biomass. 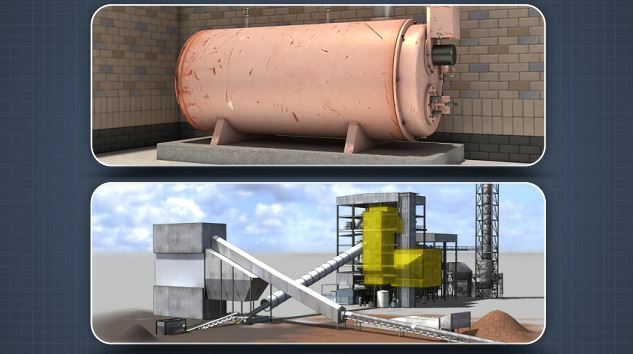 Design characteristics of power boilers differ depending on the fuel burned. These characteristics include shape of the furnace, air system design, tube spacing, super heater design, and the type of air pollution equipment installed. 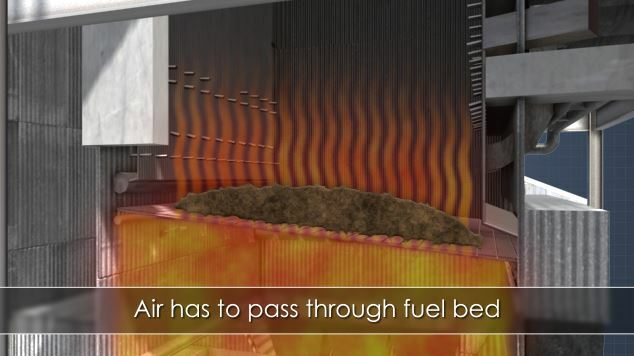 To ensure complete combustion of the fuel in the boiler furnace, enough air must be thoroughly mixed with the fuel. Each power boiler fuel requires a different amount of air for complete combustion, and the combustion controls must be designed to provide it.